Disclaimer: Thanks to Parma Ham for sponsoring this post. What a busy time of year!!! Thanksgiving is already knocking at the door and Christmas will arrive soon, too. Around this time of year people are traveling everywhere, shopping, planning, and preparing wonderful meals to share with family and friends…. And by the way, while we are on the subject of food– it is always good to keep something delicious at the ready, that you can whip up ASAP. Do you think that because I am a Chef, I don’t keep an easy ace up my sleeve? Oh yes, I do! This year it will be none other than a festive, naturally gluten-free appetizer: Bruleed Pears with Prosciutto, Cranberry Sauce, and Goat Cheese. Just thinking about these bruleed pears with prosciutto (also known as Parma ham) makes my mouth water and produces a big smile. They are gorgeous, festive, and ridiculously easy and quick to make. 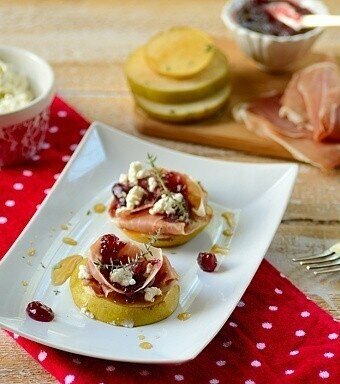 Our Bruleed pears with prosciutto are the ideal appetizer for entertaining guests without stressing out the cook. I can already foresee the smile on your face! Oh, and that’s not all!!! Did you know that if you follow Parma Ham on Twitter you also have the chance to win $50 worth of the world’s most famous ham? Click on the banner at the bottom of this post to participate. A quick, delicious, and festive gluten-free appetizer to brighten your holiday table. On a cutting board, slice pears to make 4 rounds from each pear. Remove the core from each round using a melon baller or sharp spoon. Dip pear slices into lemon juice diluted 1:10 with water to keep them from browning. Pat dry, place each round on a platter, and sprinkle 1/2 tablespoon of light brown sugar on top of each round. Using a culinary torch, brulée (brown) the sugar. Sprinkle a dash of pepper and top with a slice of prosciutto. Spoon 1 tablespoon of the cranberry sauce on top of each and sprinkle a little goat cheese on each piece. Garnish with a sprig of thyme. Serve immediately and enjoy! 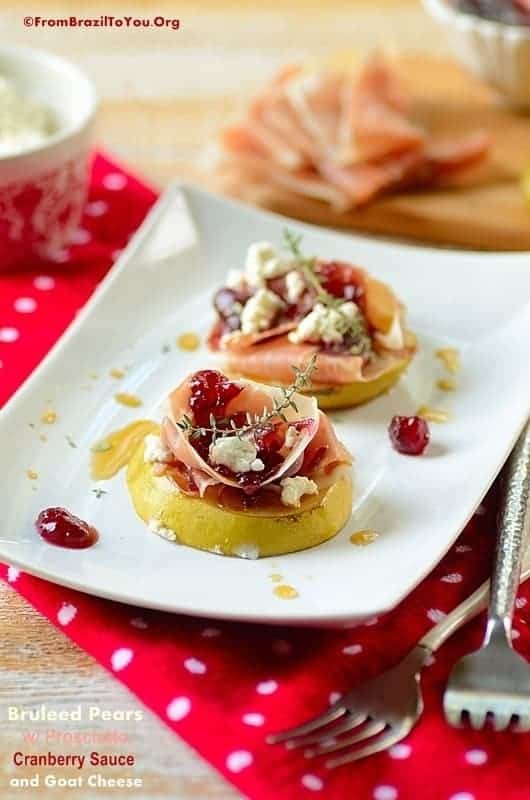 Yes, just the thought of tasting these bruleed pear with prosciutto makes me smile…the combination of the sweetness and crunchiness of the pear with the salty prosciutto is just perfect. Looks delicious and so pretty Denise! awesome, I love lots of goat cheese. 🙂 The whole combination of flavors was delish! Wow this is Masterchef quality! I love this combination of sweet, salty and spicy. Looks pretty too! It’ll make an impressive appetizer for any occasion. Thanks, Sonali! I love this appetizer! What a gorgeous dish! And what a wonderful medley of flavors! This sounds like the perfect Thanksgiving appetizer to me.. so classy !!! loved it !!! Thanks a lot, Judy! I hope you enjoy it! What a classy appetizer! We just had a dinner party this past weekend, I wish I had offered this, it is a show stopper indeed! If you make it, you won’t regret it. I think half of the amount will be enough for all. So beautiful Denise. I pinned it the moment I saw it, a winning and fancy appetizer. All the flavors together works so beautifully. Loving it. What a perfect combo of flavors! The salty, the sweet, the savory. Yum, yum, yum! Thanks, Abbe! It was quite delish! I started salivating just by seeing the title when your new post email arrived on my phone this afternoon while at work. This is absolutely gorgeous, Denise. I’ll give it a try minus the prosciutto. Love it. What gorgeous little treats! Bursting with seasonal flavor and so easy to prepare this is just the type of recipe we all need during the holiday frenzy! I have my stash of homemade cranberry sauce just waiting for me to purchase the other ingredients! Pears and prosciutto are a terrific combo. And with goat cheese? Out of this world! Good stuff – thanks. A very festive and beautiful appetiser! Both gorgeous and delicious! I love Parma ham…and this is such a lovely way to use it! Wow, what a great invention dish! Denise these look fabulous – and really festive. I would never have thought to use pears as a base, what a brilliant idea! 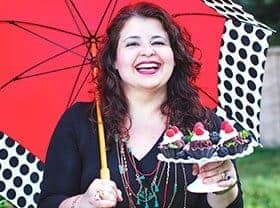 This is an amazing recipe,Denise! I’m a big (big!) lover of prosciutto so I am all over this recipe! Looks delicious! I am so glad I found your blog though a comment on Nazneen’s blog. I can tell I’m going to really enjoy your posts. And starting with this beautiful appetizer, I must make this one very soon. I’m on a pear and blue cheese kick right now, and love finding something new to do with my obsession. Pinned. Beautiful little appetizers! I love combining prosciutto and pears. Goat cheese adds just the right amount of creaminess. These are really cute gourmet appetizers, and I’d love to make them sometime! Denise, these are so clever! What a perfect appetizer for the holidays. I’m in! Thanks, Gintare! I am so happy that you love this appetizer…Wishing you a great Thanksgiving! I love how this is a simple recipe, but it looks anything but simple!! 😀 And it looks amazingly tasty as well! I need more of these kinds of recipes in my repertoire!! These have some of my favorite stuff on them!! And I love the pear-in-lieu of bread concept. Delicious.